As at the 31st March 2018 there were 562 Children in Care (CiC) in Wakefield. 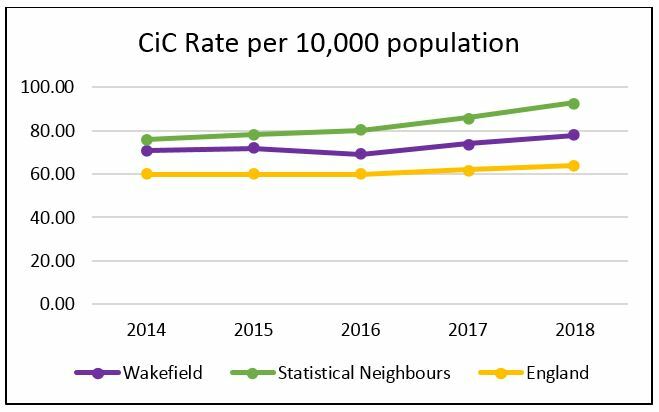 The rate of CiC in Wakefield District is increasing, at 78 per 10,000 it's higher than the national average (64) but lower than the statistical neighbour rate (92.8). Generally CiC tend to have poorer outcomes in terms of health, education and overall wellbeing. 56% of CiC are boys (higher than the 51% in the general population). 21% of CiC are from an ethnic group other than White British (higher than the 15% in the general population). The two main reasons for children being in care are abuse or neglect and family dysfunction. There were 146 care leavers in Wakefield District as at 31st March 2018. 90% of care leavers were in suitable accommodation; this is higher than the national and statistical neighbour averages (84% and 89.5%). 82% of care leavers were in education, employment or training; this is much better than the national and statistical neighbour averages (both around 61%). Greater likelihood of experiencing poor health, education and social outcomes. The following summary of data relating to CiC in Wakefield provides comparative population level information about the cohort of CiC and current outcomes in terms of attainment and health and how this compares to England and statistical neighbour data. The data which has been included is that which is published annually by the Department for Education based on the financial year to 31st March. In reviewing this data some recommendations have been identified and comment is made on whether and how these are being addressed. The rate of CiC (per 10K population) in Wakefield has increased over the last 4 years from 71 per 10,000 children in 2014 to 78 in 2018 and as at the 31st of March 2018 there were 562 Children in Care. This rate is higher than the rate for England of 64 but lower than statistical neighbour rate of 92.80. It should be noted that there has been an increasing trend over the last 4 years for statistical neighbours and England as a whole. 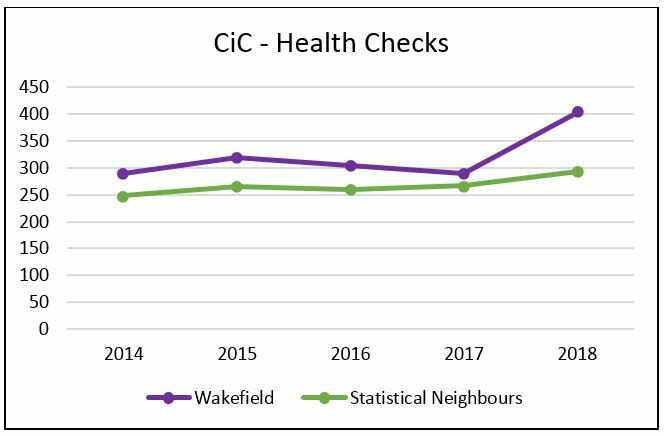 The actual number of CiC in Wakefield has increased by 15% since 2014 when there were 491. Generally children and young people in care tend to have poorer outcomes in terms of health, education and overall wellbeing. Closing the gap between educational attainment of CiC and all children and young people is a key priority locally. The figure below shows the % of CiC identified with special educational needs (SEN) or with an education and healthcare plan (EHCP). In Wakefield, the % of CiC with an SEN statement or EHCP in 2017 was 27.5%, slightly higher than the national rate of 26.7% and statistical neighbour rate of 24.97%. Over the last 4 years, this rate has reduced slightly from 30.3% in 2014 although there is still a significant number of CiC who need additional support within the education setting. In Wakefield in 2017 32.20% were identified with SEN but had no statement/EHCP. In terms of attainment, average progress scores for CiC at key stage 2 (end of primary school) and key stage 4 (end of secondary school) have been considered. Average progress scores aim to capture the progress pupils make from the end of primary school to the end of secondary school. Pupils’ results are compared to the actual achievements of other pupils with similar prior attainment. A score of 0 means pupils on average do about as well as those with similar prior attainment nationally. A positive score means pupils on average do better and a negative score means pupils on average do worse, although this does not mean that pupils did not make progress rather they made less progress than other pupils nationally. The following table shows attainment progress scores for CiC at key stage 2 and key stage 4. Average progress scores for CiC at key stage 2 in Wakefield improved in 2017 compared with 2016. For reading, CiC made less progress than others with similar attainment nationally but made more progress than those CiC at key stage 2 in 2016. For maths, in 2017 CiC at this stage performed better than others with a similar attainment level compared with 2016 and for writing this was significantly better in 2017 compared with 2017. Overall average performance in 2017 was better in Wakefield for CiC at key stage 2 than the rate nationally as well as statistical neighbours. In 2017 CiC at key stage 4 made less progress than others with a similar attainment level although they made more progress than CiC at key stage 4 in 2016, resulting in a better score. The average score was better in Wakefield in 2017 compared with national and statistical neighbour rate. Supporting CiC within the secondary school setting should be considered as an area for improvement to enable CiC in Wakefield to attain in line with their national peers. In the last few years, the % of CiC subject to a conviction, final warning or reprimand during the year have been so low, that comparison with the national or statistical neighbour rates is inappropriate. It may be helpful to review data to confirm low levels. In the last few years, the % of CiC identified as having a substance misuse problem during the year have been so low, that comparison with the national or statistical neighbour rates is inappropriate. It may be helpful to review data to confirm low levels. Whilst most CiC experience the same health issues as their peers, their past experiences and family situations can exacerbate ongoing issues and conditions which have been impacted by abuse or neglect. It is recognised that CiC have higher levels of health need than children and young people from similar socio-economic backgrounds who are not in care. To ensure that health needs are identified and addressed, statutory health and dental checks must be carried out for CiC. The following charts show the numbers of CiC who have had an annual health or dental check over the last 4 years. 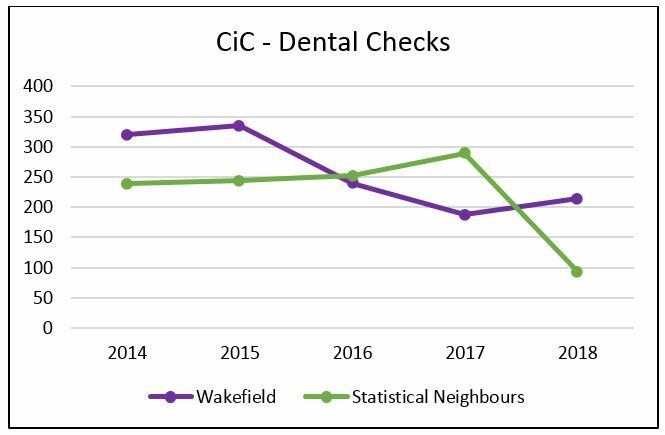 Following some decline in 2016 and 2017, completion of dental checks has begun to improve in 2018 and the number completed in Wakefield is higher than that of statistical neighbours. Completion of health checks also improved in 2018 compared with 2017. As with health checks it is vital that checks are carried out appropriately for all CiC to ensure that any preventative measures can be taken. Completion of both dental and health checks are areas that require attention. The strengths and difficulties questionnaire (SDQ) is a standardised and validated mental health assessment tool used to assess CIC’s emotional wellbeing. A higher score indicates there are more difficulties for a child with a low score (up to 15) considered low need, 15 – 17 borderline and 17 and over high need. The table below shows the average SDQ score for CiC in Wakefield and comparator information. Whilst the average score of 15.50 in Wakefield is not remarkably higher than the statistical neighbour rate of 13.94 and national rate of 14.20 and there has been a slight decrease since 2017, there has been an increase over the 4 year period and the 2018 score is just beyond the upper end of low need, meaning there will be a significant number of CiC with individual scores indicating high need. It would be prudent to explore this data further to assess levels of higher need which may need support from specialist services and there may need to discussion with Health providers to determine whether this need is being met. Young people may be legally looked after by the Local Authority up until the age of 18 and after this Care Leavers are entitled to receive support until the age of 25 if they choose to do so. The table below shows that in 2018 there were 175 Care Leavers, which has increased since 2015 when there were 115 Care Leavers, this is consistent with the overall rise in numbers of CiC. In Wakefield in 2018 90% of Care Leavers were in suitable accommodation which is higher than both the statistical neighbour and national rate. In Wakefield in 2018 18% of Care Leavers were not in education, employment or training lower than in 2017 and lower than statistical neighbour and national rate. The following interactive dashboards look at children in care in Wakefield. You can select different criteria from the menus at the right of each dashboard. This dashboard shows Children in Care rates per 10,000 population over time in Wakefield, you can select different age groups and genders to explore how rates are different and have changed over time. Use the menus on the right hand side to select the age group and gender you want to look at. The following dashboard shows the percentage of children in care by gender in Wakefield District. Around 56% of children in care in Wakefield are male. This dashboard shows the percentage of children in care by ethnic group. You can select different years to explore how things have changed over time. The latest data shows that around 20% of children in care in Wakefield defined their ethnicity as other than White British. This is higher than the percentage of children estimated in the general population. More information on ethnicity in Wakefield District can be found here. The following dashboard shows children in care rates by category of need. You can use the interactive dashboard to look at different age groups, to see how things have changed over time. This dashboard shows children in care rates by area of placement. You can use the interactive dashboard to look at different areas and to see how things have changed over time. The Leaving Care Team provides support for CiC and Care Leavers in the district aged 16 to 21 years old and a separate Leaving care service assists older children who will not be returning home. NHS Wakefield Clinical Commissioning Group (CCG) are responsible for delivering statutory health assessments and providing support for CiC in Wakefield. This includes an initial assessment which is carried out by a Doctor when a children or young person enters care followed by an annual review health assessment by a team of Specialist Nurses. The team also support and provide training to Foster Carers and Health Visitors. The Specialist Nurses provide an ongoing source of support and advice to CiC, including “packages of care” to meet needs identified at health assessments, including improving understanding of healthy eating, healthy relationships, sexual health and contraception, hygiene and self-care, dental care, smoking, drugs and alcohol. They also support young people to transition to adult services and have developed a Leaving Care health summary to provide young people with important information about their health from birth. Heath assessments for under 5s are carried out every 6 months by Health Visitors. CiC are able to access universal health care services such as sexual health . All children are registered with a GP and a dentist to ensure their health needs are fully met. The CCG is also commissioned to provide a dedicated CAMHS service for our CiC. In addition they co fund along with Children’s Social care an Emotional wellbeing Team with 4 practitioners offering tier 1 and 2 support to our CIC and also provide practical support for Residential Childrens Homes and Foster Carers. Wider support and training for staff and carers is also part of the team’s remit and there is close working with staff in the residential Childrens Homes, which is important when young people are not willing to directly see a mental health worker, so training for social workers and carers to support the young person is an alternative approach. Therapeutic Social workers also play an important role in supporting young people and carers when things have improved and they no longer need to be seen by the specialist service. As the average SDQ score for CiC has moved upwards, it would be prudent to look at indviduals with higher scores to determine that action is being taken to support CiC with their emotional wellbeing where required.